We don’t get very many visitors (me and the bees), but last week Tom D. had already lined up a visit to the bee yard in New Market (Zweber Farms). He had expressed an interest in seeing the bees a few months ago, before the weather got nice. And Sunday 30-June was a drop-dead gorgeous day! Tom had some folks from out of town visiting him, and asked me if Frank H and his daughter could tag along and go into the hives with us. Well, of course! We tasted some honey right out of the frame when they arrived, talked a little about what they’d be seeing, and then took a short drive out to New Market. 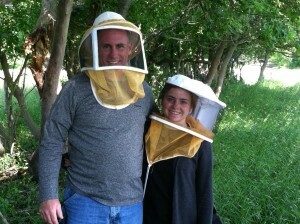 They all took turns getting into my spare bee suit, and we had a short inspection for Tom, Frank, and daughter “J”. At 16, almost 17, J was interested, asked a lot of questions, and held a frame full of bees and brood (eggs, larvae and pupae) without flinching! Heck…the first time I pulled out a full frame of bees I was nervous, and J did a great job. It probably wasn’t the first thing she would have picked to do on a Sunday afternoon (go out to some cow pasture on a hot afternoon, put on some dumb white jumpsuit overalls and listen to some old guy rant about his..what…honeybees? sheesh, dad…like really?) But we all had a good time, and I hope I taught them a little about the bees, their troubled times, and let them taste just how amazing real local honey can taste as opposed to the Jewel store brand. Frank and his daughter with their bee veils!